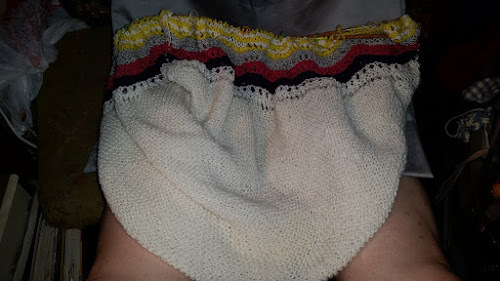 The knitting continues on the Baby Hap. I finished the last row of yellow and am on the first Gray row, the color pattern is now reversed, with the gray to be followed by pink and then the dark purple and more white. I rummaged in the stash and found four more skeins of the Eggplant (purple), so I have plenty to use for the sideways lace bind off around the perimeter. 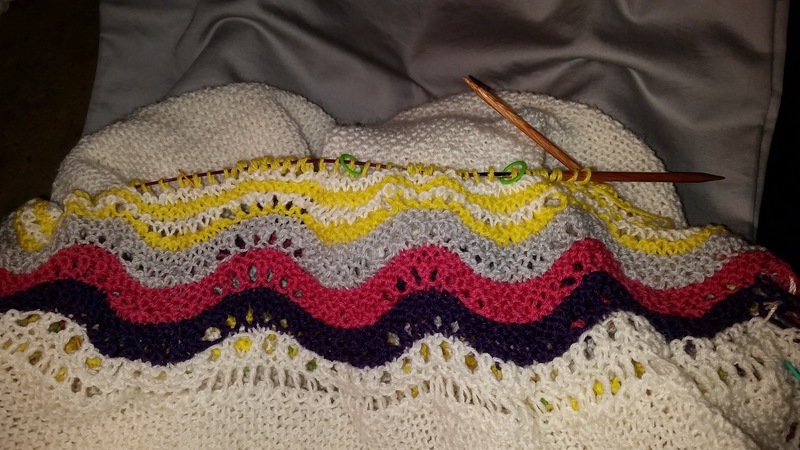 I have been greatly enjoying knitting this hap shawl/blanket. I finally broke down and bought The Book of Haps. 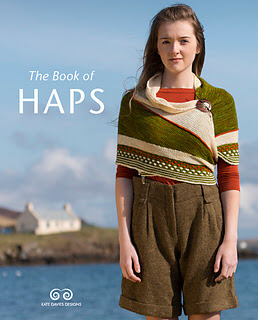 Haps are traditional everyday workhorse type of shawls from the Shetland Islands. I love the style. And even though the hard copy will be coming from overseas, I was able to also download the book files as well. I decided the book is definitely a winner. Because the hap is knit in the round after the center square, it gets bunched up and hard to take pictures. However, it makes a handy built in sack that I can throw the ball of yarn into as I knit. If it wasn't for the lace pattern, it would be quite portable.